"When actor Richard Dreyfus gazed up into the heavens during the hit film, Close Encounters of the Third Kind audiences looked with him, in rapt attention. Alien encounters cropped up like, well, crop circles. More films were released. Books detailed alleged abductions. NASA funded SETI, an effort to make contact with civilizations from other worlds. But is all this valid? Are there really alien civilizations in our vast universe? 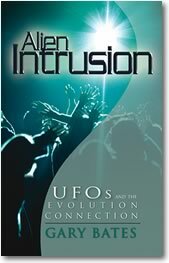 In Alien Intrusion, Gary Bates gives a thorough treatment of this fascinating subject. What is behind the numerous sightings from around the world? Does the U.S. Government have evidence of alien craft? Can we hope to mkae contact in our lifetime? The author comes from an unapologetic Christian perspective, but lets the facts speak for themselves. His expertise on the subject and ability to 'cover the bases' has earned widespread respect - even from many in the 'UFOlogy community' who may be uncomfortable with the startling conclusions to which he inevitable leads the reader. This was especially evident during an amazing three-hour interview with George Noory on Coast to Coast. This invaluable book will help Christians understand the issues, and be able to intelligently answer questions and engage in dialogue with a culture sure were are being watched from space. Heavily illustrated with photographs and drawings - an amazingly comprehensive 'cutting-edge' look at the UFO abduction phenomena." "In dealing with the mystery of UFO's, we are not on the lunatic fringe of theology. Instead, we stand on your behalf in front line of battle. We are in defensive warfare at a major point of assault on humanity." Dr. David Allen Lewis, Author, "UFO: End Time Delusion"